"You dive like you train"
This course will bring the diver to exemplary diving skills: Rescue skills, professional level knowledge of dive theory, competences as a certified assistant, dive management and supervision abilities. Course prerequisites: 18 years old minimum – be Aowd, O2 provider, Rescue Diver. 1. A sufficient quantity of gas will be carried by the diver to allow completion of the dive time requirements incorporating the correct gas management rule. For no-stop diving, ½ + 200 psig (14 bar); and for dives with stops or in overhead environments, the Rule of Thirds. 2. A primary gas supply systems featuring an alternate second stage or alternate breathing source, or redundant gas system as specified in the Equipment Requirements for each Program. 3. A quick release weight ballast system (if appropriate). 5. Buoyancy control device (BCD), including a cylinder support system. 6. Mask, fins and snorkel (if appropriate). 7. Means of monitoring depth and bottom time. 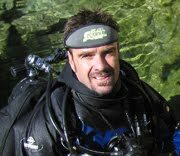 This can be done through the use of a depth gauge and bottom timer or a dive computer. 9. Appropriate exposure suit for the environment in which the diver is being trained. 10. Slate and pencil. (not required in the Supervised Diver or OW Diver course). 11. Cutting tool or device. 13. Surface alert device (whistle, diver alert, etc.) (not required in the Supervised Diver or OW Diver course). 14. Equipment is to be configured in a neat low-drag manner. 15. A lift bag of at least 50-lb. (22.5-kg) lift capacity and a line reel for deployment. 16. Either a dual-outlet valve or a separate 18 cubic feet (510 free liters) pony cylinder or greater capacity must be used. If a Rebreather is used, it must be equipped with adequate bailout. 17. Bolt snap hooks / scissors clips used for attaching equipment to the diver are recommended. 18. Either a dual outlet valve and a separate pony cylinder, a standard valve and two pony cylinders or double cylinders with dual valve out let or side mount configuration with a decompression stage cylinder must be used. If a Rebreather is used, it must be equipped with adequate bailout.